Can it be true? Has spring finally arrived? By my calculations we are about one month behind. But don't worry Mother Nature can quickly catch up. We all know it won't be long before we will be flicking the air conditioners on. Your plants are likely growing very rapidly too. Tomatoes are needing trellising and new growths from shrubs are pushing over the pathways. There is a lot of training and controlling of growth to be done at this time. The sooner you do it the better. Out of bounds plants are hard to get back on the right track. 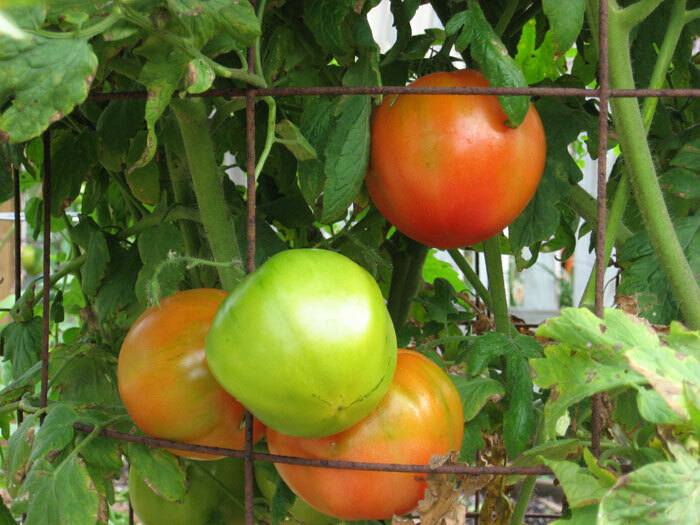 Wire cages make great containers to use in trellising tomatoes as seen in the picture. Many want to know if the lawns are going to survive. By now you should be getting an answer. 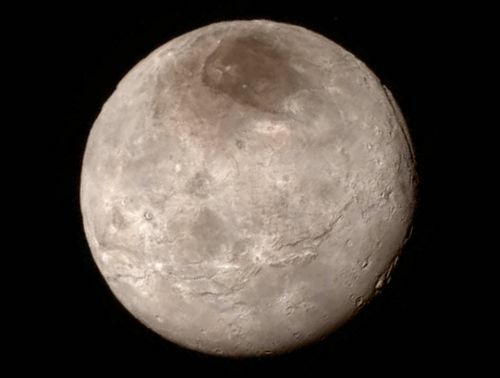 Most are sending up new shoots signaling all is well. Now is the time to encourage growth with the spring feeding, watering and mowing as needed. Now is also the best time to control many of the weeds. Winter weeds put on lots of growth. Yes, some like chickweed will decline no matter what you do but others can continue to blanket the turf. You have a choice of using weed and feeds or liquids made for your lawn type. Just be sure to follow all label instructions. When it comes to vegetables, it is warm season time. Transplants of the cool season crops are not a good buy. It's tomato, pepper, bean, squash and cucumber time. If you are planting tomatoes and peppers might I suggest you obtain the larger plants. Quickly it is going to get too hot for some of these crops. Complete spring lawn feedings; select a low or no phosphorus fertilizer. Control weeds while they are small and more likely to be affected by herbicides. Weed & feeds can be substituted for regular fertilizers; follow label instructions. Fill in bare spots left by cold or pests before weed growth begins. Begin regular mowings at recommended heights for the lawn type. Chinch bugs are active: apply needed control to St. Augustine lawns. Rake dead grass blades out of the lawn or allow new growth to hide the brown. 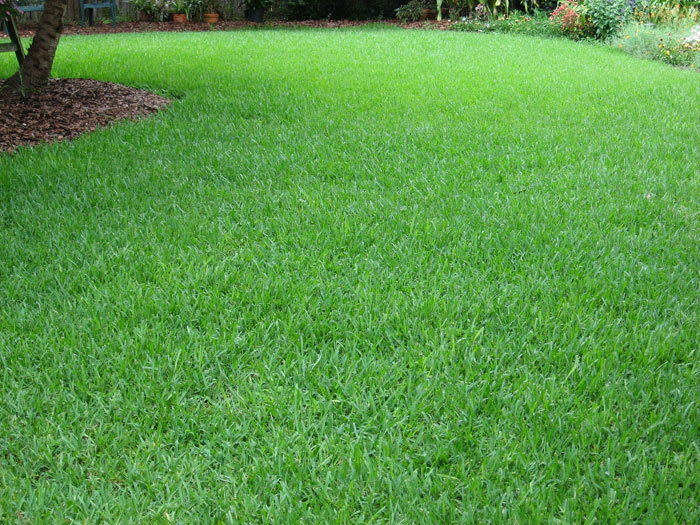 Consider a drought tolerant grass when installing a new lawn. Yellow lawns can often be regreened with an iron only application. Remove excessive amounts of tree leaves from home lawns before mowing. Eliminate established crabgrass and resod to prevent seed germination. Check the soil acidity of home lawns; adjust the pH if needed. Continue to prune cold damaged from landscape plantings. 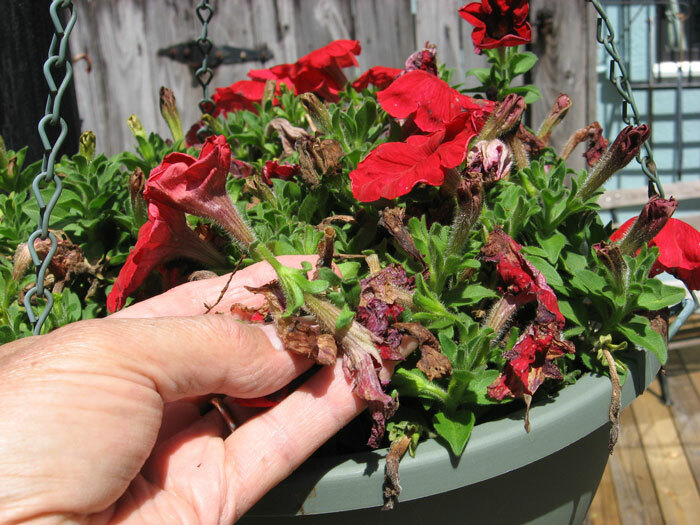 Give severely damage plants time to recover before considering replacements. Replant with a majority of cold hardy shrubs and perennials as needed. 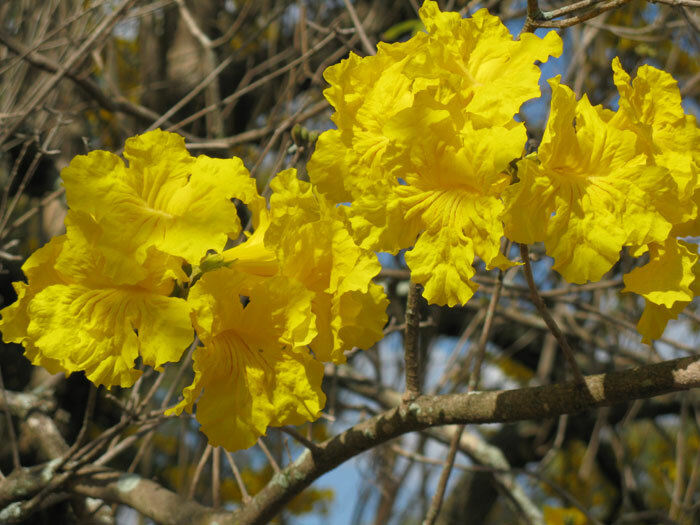 Most trees and shrubs are very drought tolerant; water only when they show signs of stress. Create separate watering zones for trees, shrubs and other ornamentals. 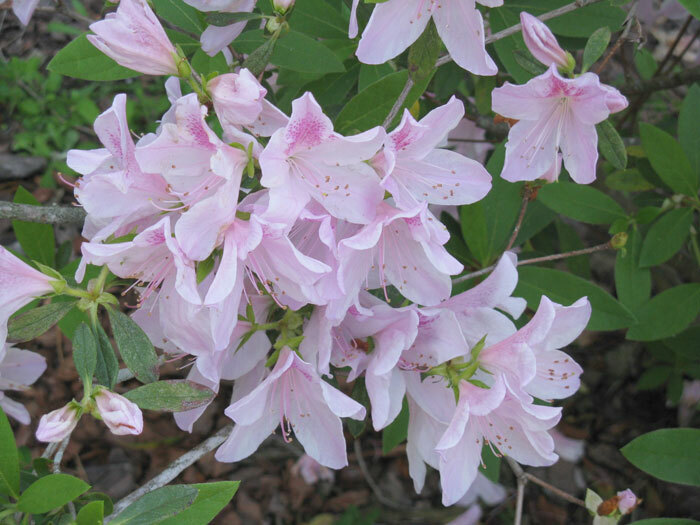 Maintain 2- to 3-inch mulch layers around trees and shrubs; one inch in flower beds. 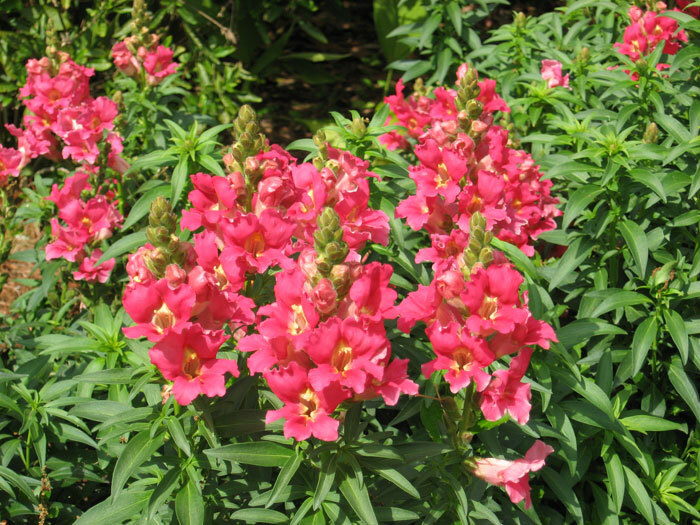 Install water conserving micro-sprinklers among flowers and shrub plantings. Repot or add holiday poinsettias to the landscape; give all a spring trimming. Weed landscape plantings to reduce competition for water and nutrients. Complete pruning of overgrown plants. Create low maintenance perennial gardens. Check sagos for white cycad scale; control as needed with a natural oil spray. Use slow release fertilizers to feed landscape plantings and help reduce pollution. Trim old flowers stalks from amaryllis, amazon lilies and other spring flowering plants. Edge walkways and trim limbs obstructing traffic. 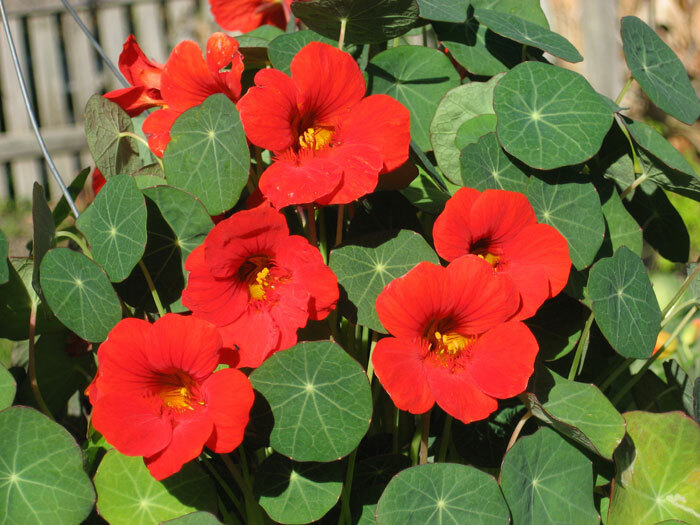 Replace declining winter flowers with warm season color. Trim palms as needed but keep most of the green fronds; sterilize pruners between palms. Feed palms with an 8-2-12-4Mg slow release fertilizer as instructed on the label. 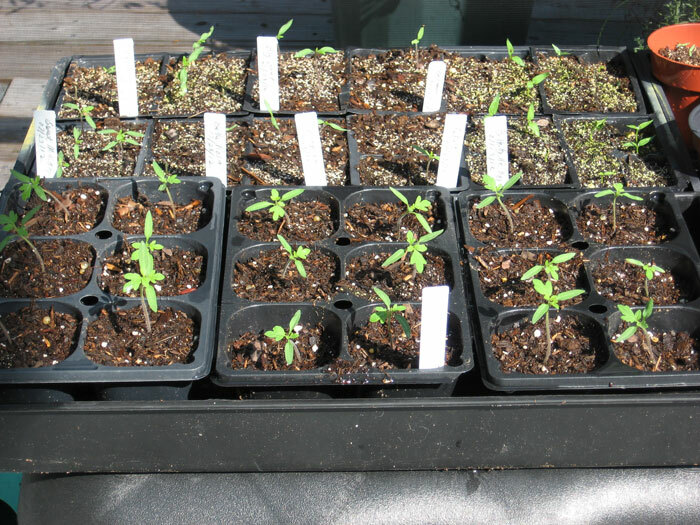 Select large tomato, pepper and eggplant transplants; sow seeds of most other crops. Gardeners with limited space should consider growing vegetables in containers. 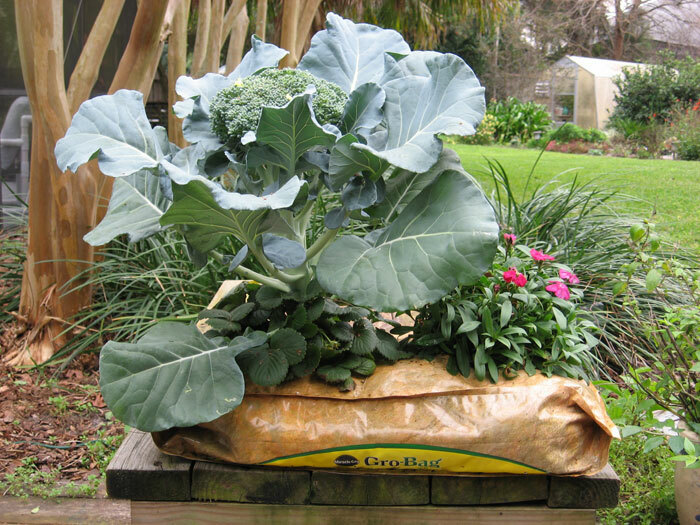 Feed vegetable plantings lightly every 3 to 4 weeks or use a slow release fertilizer. Install miro-sprinklers or use soaker hoses to conserve water. Pine bark fines may be used to make soils more acid for blueberries. 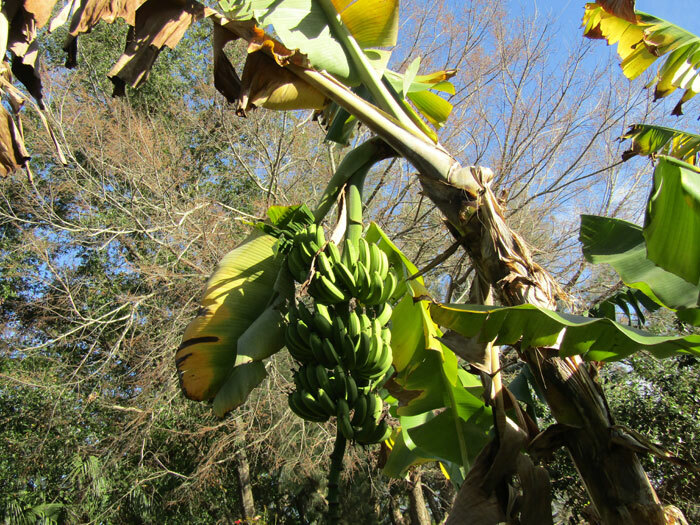 Many bananas are regrowing from the ground; keep moist and feed lightly monthly. Hurry to prune grape vines and train them to an arbor or trellis. Citrus greening has become a problem; decide if you can control the pests before planting. Finish spring feedings of all fruit trees. Transplant papaya seedlings to the landscape, keep moist and feed monthly. Begin plantings of tropical vegetables that won't mind the summer heat and humidity. 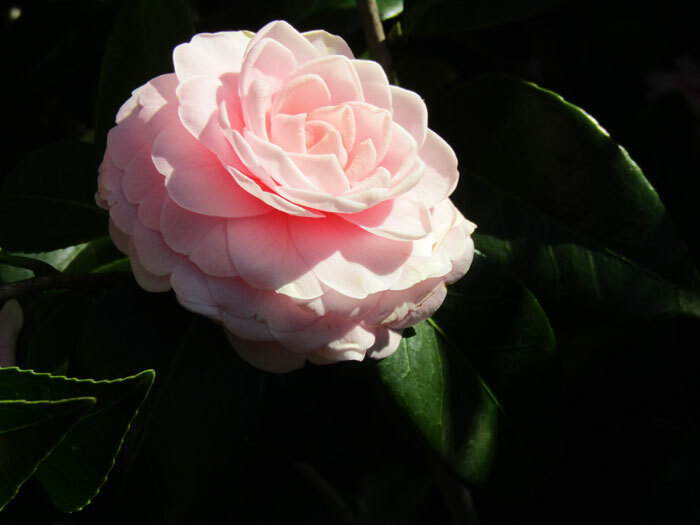 Remove damage and reshape plants that suffered from cold. Remove yellowing foliage and flowers; repot indoor plants as needed. Give foliage plants a spring feeding. Move spindly plants to the patio for warm season rejuvenation. 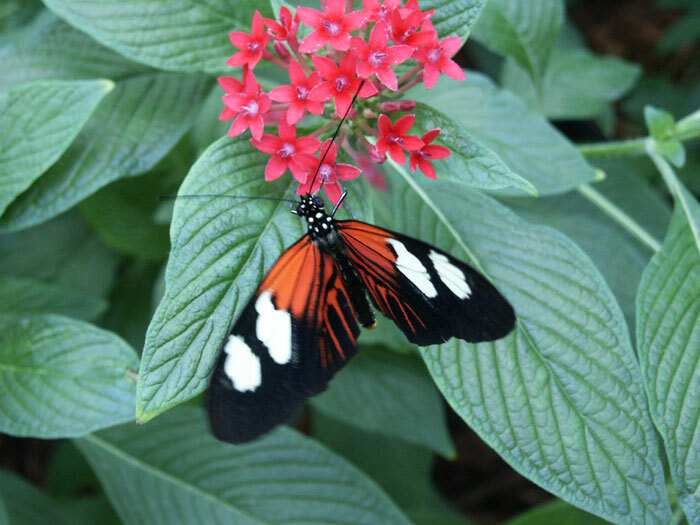 Give remaining indoor plants the brightest spot possible but out of the direct sun. Add a saucer to plants on patios to capture and conserve water they can continue to use. 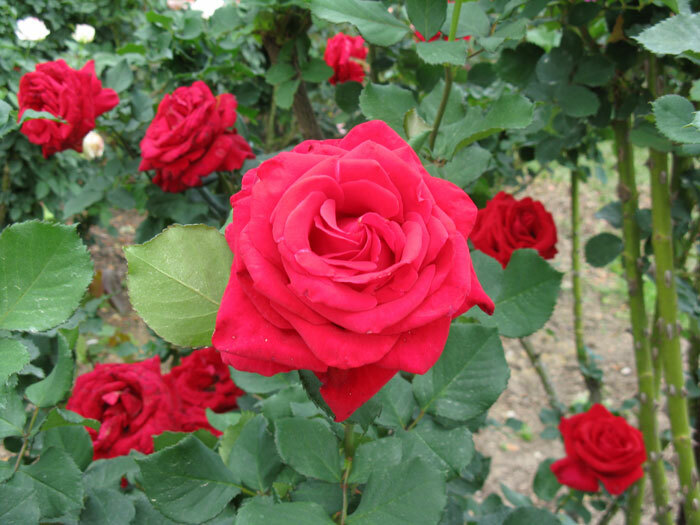 Replace poorer quality plants with new selections. Discard declining tulips, hyacinths and daffodils but keep the pot. Flowers: African daisy, ageratum, aster, bacopa, balsam, begonia, black-eyed Susan, blue daze, bush daisy, cat's whiskers, celosia, cleome, coleus, coreopsis, cosmos, crossandra, dahlberg daisy, gazania, gaillardia, gerbera, goldenrod, impatiens, Joseph's coat, lantana, lisianthus, marigold, melampodium, Mexican sunflower, million bells, moon flower, nicotiana, nierembergia, pentas, periwinkle, porterweed, portulaca, purslane, salvia, sunflower, torenia and zinnia. Herbs: Anise, basil, bay laurel, borage, cardamom, chives, coriander, dill, borage, ginger, lemon balm, oregano, Mexican tarragon, mint, oregano, rosemary, sage, savory, sweet marjoram and thyme.